"Here you will find a treasure trove of beautiful, hand made leather masks and other mementos from an unusual journey into the worlds of imagination and spirit." A treasure trove is right! Here's a shop filled with fantasy and beauty. An artist who creates jewelry and masks. Pilgrimage is a beautiful display of a very talented artisan who has worked in a number of different artistry inspired fields. The masks, in particular, caught my attention as they're not just beautiful but they're made for more than just display. 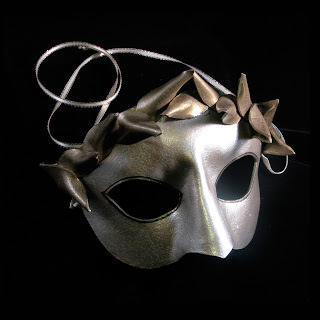 Each mask is made following the ancient tradition of the Venetian mask makers out of light-weight leather to be both durable and comfortably wearable! They are each carefully shaped, finished and painted by hand, with no laser cutters, airbrushes, vacuum formers or anything involved other than paintbrushes and a few simple tools. For me, this brings an entire new level of "wearable art" to forefront. YOU CAN CLICK ON THE PICTURE ABOVE TO VISIT PILGRIMAGE'S SHOP OR, IF YOU PREFER, CLICK RIGHT HERE. Who is Nadia? And where does she get her Beads?